Being that my father’s side of the family is Greek, it should be no surprise that I am a lover of all things Mediterranean. When I was invited to test out Roti’s gluten free menu I obviously jumped at the chance! Located in the heart of NYC’s Financial District, Roti Mediterranean Grille is a chain restaurant that prides itself on providing healthy food that leaves you satisfied. 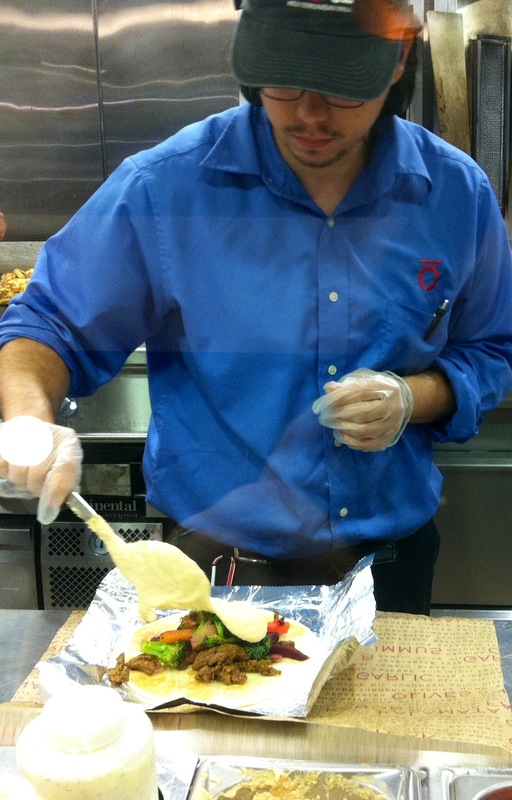 At first glance Roti reminds me of Chipotle Mexican Grille; offering assembly line efficiency for its food service. However after eating at Roti, there are differences that sets Roti apart. Roti really sets the bar high for fast-food chain restaurants that serve gluten free food. It has a completely separate station with dedicated staff that’s strictly for gluten free orders only. The food is packed and stored completely separate so it never comes in contact with gluten. However when serving gluten and gluten free food in the same restaurant you can’t always guarantee 100% no cross contamination. Roti’s pita is better than any other I have ever had (and I’ve eaten many pitas). It was a bit more “fluffy” than a traditional pita and had a hint of butter that made it taste good all on its own. I guess the closest comparison would be a really thin pancake but not as thin as a crepe. The grilled steak was good and combined with the crunch the red cabbage slaw had and the saltiness of the feta, made it a really good combination. The hummus was definitely on point and tasted like traditional american hummus. I wasn’t a big fan of the roasted veggies (broccoli, beets, carrot, brussels sprouts, cauliflower and kale) with my pita. They seemed fresh but it just didn’t do it for me so I would recommend leaving that out of your pita. My two favorites are the Red Pepper Aioli and Dill Yogurt. One of the employees, Richard, recommended I mix the two sauces together which I ended up doing and it tasted awesome! Fun Fact: Roti is planning to open a second location in mid-town near the Chrysler building mid to late summer 2013. Check out the full gluten free menu here. Overall Roti gets two thumbs up from this girl! Not only does it offer good quality, great tasting ingredients but it takes gluten free very seriously which I respect and appreciate. The staff is also trained on what gluten free is and why it’s important to be safe when handling the food. 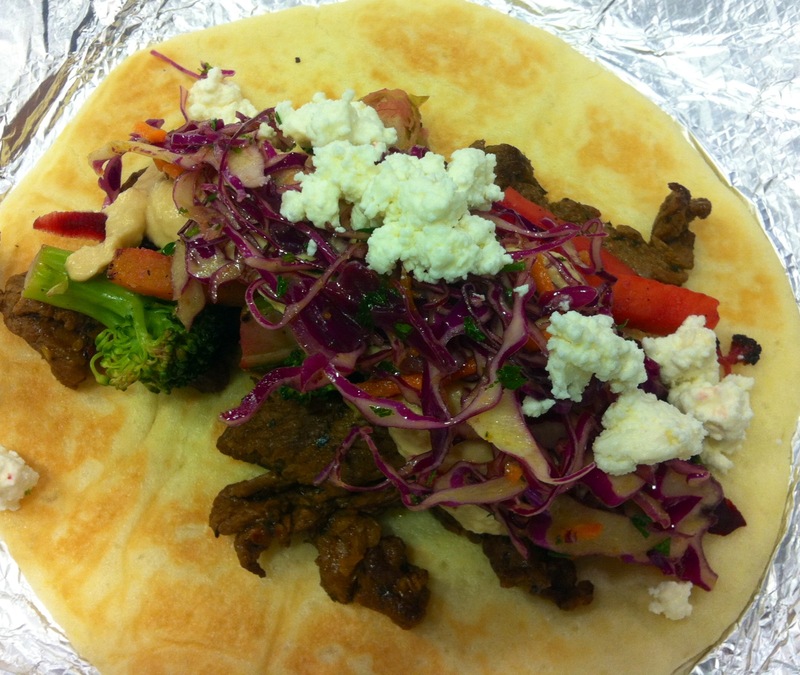 For being a fast-food chain restaurant, Roti makes some really good tasting Mediterranean food.